Sally is a versatile violinist and electric violinist who enjoys playing an eclectic mix of genres and styles from classical to commercial pop, house, techno and RnB. A high-impact performer, Sally interacts with the crowd, and has thrilled audiences worldwide with her ability to combine choreography and improvisation into performances. She is available to hire for corporate events, private parties, balls or weddings and will leave the guests at your event amazed with her exceptional violin skills. Sally has been classically-trained on the violin since the age of 3 and was educated at Oxford University before gaining a Distinction in her Masters in Violin Performance at Trinity Laban Conservatoire of Music and Dance. Sally now plays electric violin in London, throughout the UK, and around the world, and has played at venues such as The O2 Arena, Cardiff Millennium Stadium, The Royal Albert Hall, Wembley Arena, Hammersmith Apollo, The Sporting Club Monaco, and The Roundhouse. Performances have taken her around the world to places such as Bermuda, Qatar, Monaco, Bahrain, Thailand, Myanmar, Malaysia and Macau, as well as regular tours throughout Europe. Sally has a wealth of experience performing for celebrities at events such as the UEFA Cup Final Dinner, ExxonMobil Tennis Gala Dinner, football conferences, fashion launches, and VIP weddings. Recent clients include Alexander McQueen, Vogue, Jaguar, MINI, Sergio Rossi, Swarovski, Aquascutum, Dell, Nina Naustdal and London Fashion Week. Playing over DJ sets, Sally has performed at many private parties, opening sets for artists such as Jessie J, Madness, Bob Sinclair, and has jammed with legendary producer Timbaland. 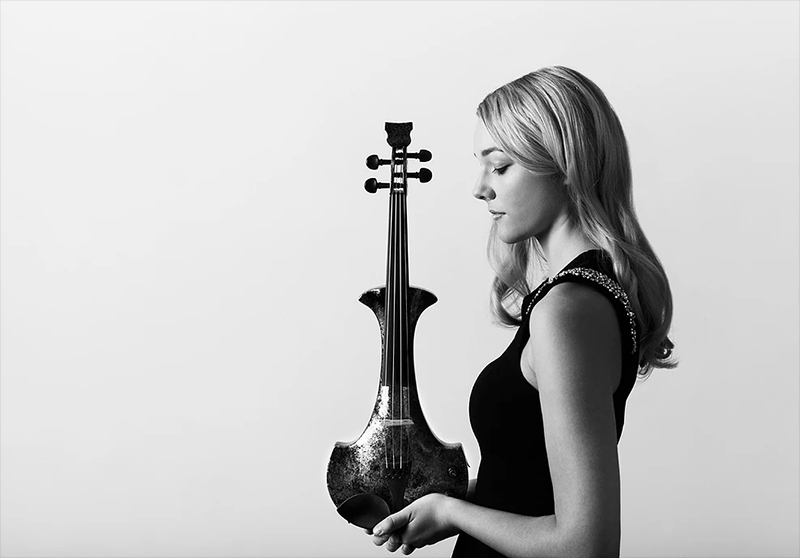 As a backing violinist, Sally has performed alongside some of the UK’s biggest artists such as Calvin Harris, Ellie Goulding, John Newman, Rita Ora, Sigma, FKA Twigs, Don Broco, Alfie Boe, Andrea Bocelli and Russell Watson. Television performance credits include The BBC Music Awards, Britain’s Got Talent, Strictly Come Dancing, Top of the Pops, The Alan Titchmarsh Show, QVC, and The X Factor to name a few. Sally plays a Ted Brewer clear perspex LED electric violin, a silver marble Bridge electric violin, and a silver Violectra electric violin.